It’s 10:02 at night, I have one load of laundry drying and another washing, and the house smells like Thanksgiving because I got it in my mind that I needed to finish breaking down the roasted chicken carcass and get the stock made before letting it go another day. I probably should be in bed, but I don’t run on Tuesdays, and this week has hit the ground running. I realized tonight that Katie and Eric had no clean jammies to wear—and I horde jammies (I like cozy clothes, what can I say?) so it was a do-or-die laundry situation over here. We found some comfy relaxing clothes for bed tonight, and I am up making sure the lint trap doesn’t catch on fire while the dryer is going: one of my neuroses. Ever since my dad mentioned it could always be a possibility, I am unable to run the dryer without being a few feet away from it. This morning started with a 4.06 mile run in 27:33.3, a 6:47 pace. Coming off of yesterday’s 10 miler, my legs felt a little sizzley, and when Bill told me he wanted me to go four miles fast, I had a moment of doubt. Actually in my mind I had the momentary thought, my husband must be joking! but I tried to keep my poker face. Then I started—determined to meet his task for me—and I could feel my legs settling into their new zone and popping off the ground. Bill always knows what he’s doing here, evidently. A beginning mile that was half uphill at 6:51 encouraged me, and then when mile two clocked in at 6:40, I knew I was going for it. All sub-7:00, I told myself, even up the killer hill home. I surprised even myself, coming off that 10. I’m really feeling like I am in a new place that I haven’t been yet. Bill has promised track work for me this week, and even though it hurts like heck, I am excited for it. Do it now, get the pain, be better a few weeks from now. The reward center in my brain is already lighting up! Eric was up early this morning, shortly after I returned home. We read for a bit and then he helped me count out my weights. I never did fit in my recovery yoga this morning, but we all did a walk after dinner so my legs feel good. Katie woke up a bit later, and then we went with my mom for an early morning blueberry picking session at our local farm. Our goal was to pick enough to make jam with leftovers besides. The kiddos have discovered that frozen fresh blueberries are sweeter than candy, so we hope to freeze a bunch for dessert after dinner. 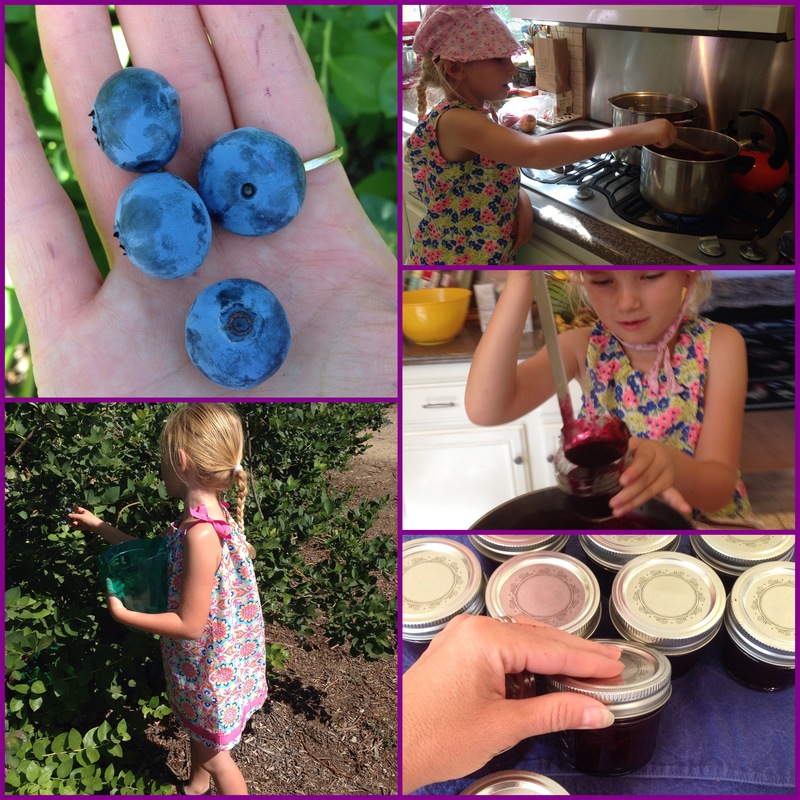 After her horseback riding lesson and the gift of two lemons for the jam from her riding teacher’s tree, we came home and tried our hand at blueberry jam. With the exception of one batch of marmalade that turned out deliciously about three years ago, I would not count myself as any kind of proficient jam maker—yet. In fact, in my life I have failed numerous times to get the art quite down. But this time? I was determined to get it right. Katie helped, and we took it step by step, no rushing (usually my problem) and made an afternoon of it. And we had success! Having to explain the process to my daughter, I found that a few aspects of jam making really clicked more for me today, once again supporting the idea that we learn the best when we are teaching someone else. Katie and I are terribly excited now to try our hand at all kinds of jams. In fact, she talked the whole three mile walk after dinner about how she wants to make more jams, hopes we try to pickle, and desires to can sauces and make pies to freeze for later. She definitely discovered a passion today and has all kinds of plans for our pantry and for sharing with friends, family, and neighbors. Well, my stock is done and needs to be divided into two-cup portions for freezing. And as it turns the corner to 11:00 PM, I am thinking about how very much I want to fit a yoga session in tomorrow morning since it is a no-run day. During our walk this evening, the air was summertime warm with a light breeze scented with jasmine vine—the essence of all that I love about summer, in one scent. It will not catch fire if the lent filter is cleaned. Sorry for all those years of worry.